Ability to handle pressure – The CEO of a mobile app agency (or any corporate firm, for that matter) is, for all purposes, the captain of the ship. There will be work pressure, stress to meet deadlines, and a constant endeavour to satisfy clients. It also has to be kept in mind that not always will things go according to plan, and some projects will fail…adding up to frustrations. The key here lies in how well a leader manages to handle such situations. If (s)he gets rattled and panic-stricken, the employees will get nervous and tense as well. An entrepreneur who remains calm under pressure and maintain his/her clarity of thinking can: a) devise strategies to tide over problems, and b) let the workers stay relaxed and clear-headed. It’s all about the type of example you set. Hiring manpower for long-term solutions – And not for short-term fixes. There is a difference between recruiting the ‘right person for the right job’ and ‘the right person for the right job NOW’, and if the CEO and the recruitment team (i.e., the HR department) does not distinguish between the two, there’s bound to be problems. The focus should always be on inducting people who are likely to add value to the company 2, 5, 10 years from now, as the company itself grows and the way of work evolves. A candidate might come along with a mighty impressive resume, but if (s)he does not seem a good fit for the company in the long-run – there is no point in hiring him/her. A clear vision for the company – Back in 2006 when I started out with Teknowledge, our resources were, at best, modest. Even though the iOS and Android platforms were yet to be launched at the time, I knew I wanted to lead a company that made mobile applications. A decade later, I believe that my clarity of vision (coupled with, of course, the dedication and hard work of my colleagues) has helped Teks Mobile become a leading global app development company. Many new IT leaders are confused about visions for their companies. This, in turn, inevitably leads to muddled decision-making. Eagerness to learn and grow – The post of the CEO is the seniormost in a mobile app making company…but the moment a person starts treating that designation as an achievement in itself, that’ll be the start of his/her (and his/her company’s) downfall. The tech industry, and the domain of Android and iPhone app development in particular, is in a constant state of flux – and there is simply no room to remain static. The onus is on present-generation CEOs to keep track of all the new happenings, and constantly enhance their knowledge pools. If you cease to grow, your company would follow suit…soon! Ability to build a strong organizational culture – The importance of an IT entrepreneur as a role model for his/her employees comes to the fore once again here. The CEO is in charge of building the company culture (call it ‘way of work’ if you will), from the ground up. This includes a lot of things – right from how many hours you stay at office (if you are the first to arrive and among the last to leave everyday, that sets a precedent for others) and staying updated with the status of all app projects, to knowing what motivates and encourages workers, what their emotional triggers are, and even organizing regular offsite fun trips. A well-versed tech leader looks upon his/her company as a family…a family that has to be nurtured well. Oh, and in this context, let me just share something: The Teks team will be off for a beach weekend this Friday! The importance of empathy – This responsibility is two-fold. Firstly, a tech entrepreneur has to be able to put him/herself in the shoes of the employees – to understand their needs, views and perspectives (this can range from a situation where an iPhone developer is stuck while working with Xcode, to a simple application for leave). On the other hand, it is also on the CEO to look at app ideas and projects from the client’s perspective. Unless the former understands what the client actually wants, how on earth will he able to explain the project to the developers? In a way, an IT leader has to love technology (but of course! ), but (s)he has to love people more. Being too mechanical is never the right strategy. Ability to facilitate collaborative work – This is not just limited to being effective scrum masters. Any decent mobile app company has a fairly large number of team members, separate teams of iOS and Android app developers, a creative group (the graphic artists and UI/UX designers and animators) and other backend staff. A mobile app leader has to constantly make sure that these different teams are properly collaborating with each other, while working on projects. If there is any miscommunication between, say, a developer and a designer, the product (i.e., the app) will suffer…and that would lead to repeat work, and wasted man-hours. A leader cannot simply sit in a cabin and delegate work, (s)he also has to ensure that the people on the job are collaborating with each other well. Building on personal strengths – As a mobile app entrepreneur, I make it a point to identify the strengths and weaknesses (oh yes, everybody has some) of each of my employees. It’s a known fact that one person cannot perform all tasks, and it is of essence that people are given the job that they are likely to excel at. What’s more, a leader should not lose sight of the things (s)he herself is good at either. If you are an excellent coder, spend some time everyday coding for apps. Take time out of your obviously busy schedule. If personal strengths are not polished regularly, they no longer remain…strengths. Identifying the important stuff and discussing them with others – Company CEOs get hundreds of emails and phone calls every day. All of them SEEM important, but only a handful of them are actually so. A core skill of an effective leader of a mobile app company is the ability to decide what is indeed important, and what can be directed straight to the ‘Trash’ folder (i.e., identifying the wheat from the chaff). Only then should (s)he get into discussions with team-members, on how to act on the important topics. A good tech CEO never wastes time on unnecessary meetings about things that simply does not matter. Boosting the confidence of workers – Innovation plays a huge role in the creation of custom mobile apps. Problems can crop up if a CEO is too strict and has a heavy-handed approach while interacting with employees. In such scenarios, people shirk from taking risks and thinking out-of-the-box, since they (often correctly) think that a failure would lead to a strong rebuke, or even loss of job. Once again, an app entrepreneur has to encourage people to take risks and show off their innovative thinking prowess – while working on app projects. They should never be afraid to express themselves at work. A confident worker is always a high-performer. Top-notch communication skills and a strong moral character are also must-haves for a mobile app entrepreneur. When (s)he addresses employees, the latter should be able to believe that their leader is thinking about their collective growth and success, and not only about his own benefits. Having a nice sense of humour is important too. A light joke in the middle of a meeting or on the work floor, eases a lot of the tension that app developers are subject to, day in and day out. Leaders have to be likeable people, who know how to get the job done (and done well) from workers. It’s 2016, and CEO’s should no longer be archaic ‘Hari Sadoo’-s! With that, we wrap up yet another edition of AppBoard Tuesday. Do let us know if you can think up any other necessary qualities in a mobile app entrepreneur. We will be only too happy to listen to your views. AppBoard Tuesday will return next week, with yet another interesting topic related to mobile app development. Till the next time…love thy apps! The iOS training workshop is named ‘iOS-Con 2016’. ‘Deal With Droid 2016’ is the name of the Android workshop we will be hosting. 20 each at the iOS and Android training workshops. We have kept the total number of seats at the event limited, to keep the entire thing focussed. Only genuinely interested candidates are requested to register for the event. 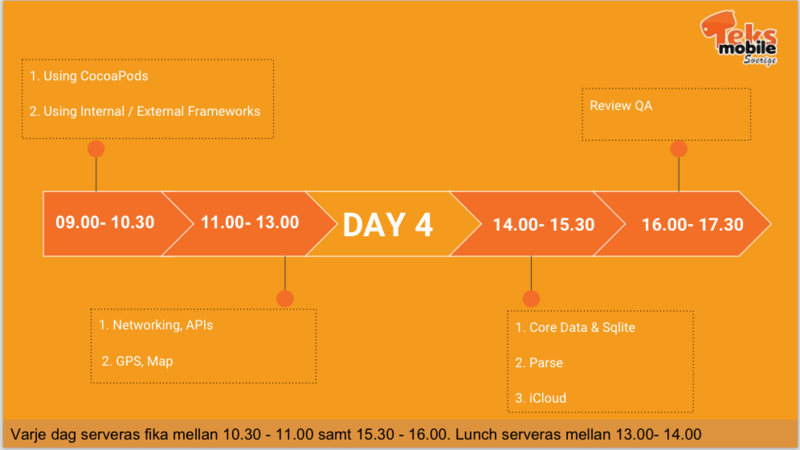 On each day of the Teks Sweden iOS workshop, there will be 4 sessions. A half-hour morning recess has been scheduled from 10:30 to 11:00, the lunch hour is from 13:00 to 14:00, and the afternoon hi-tea will be from 15:30 to 16:00. 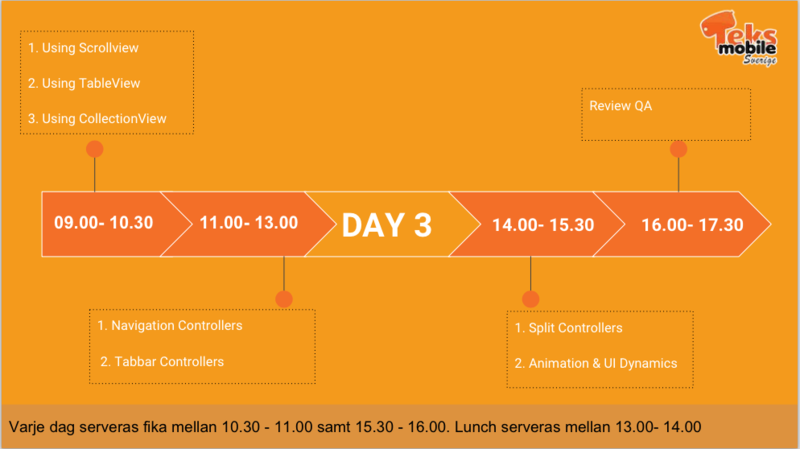 Day 2/May 10: 09:00-10:30 – Introduction to different UI controls. Just like its iOS counterpart, ‘Deal With Droid 2016’ will also be held over a span of 5 days at Kistamassan. The recess and lunch timings are the same. 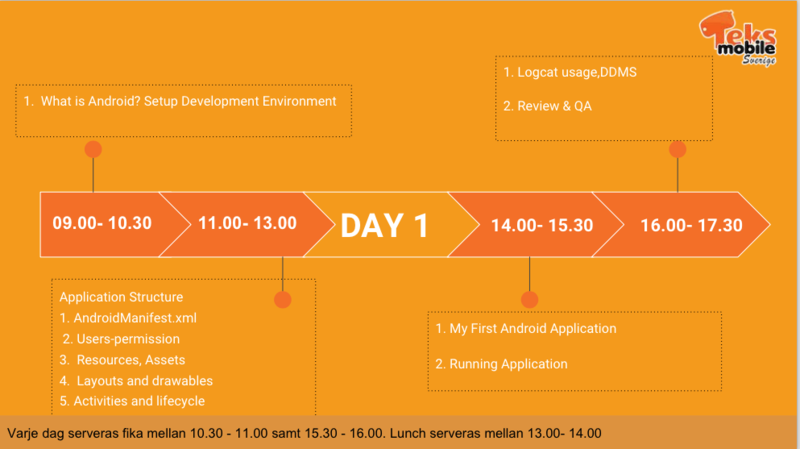 Day 1/May 9: 09:00-10:30 – What is Android? 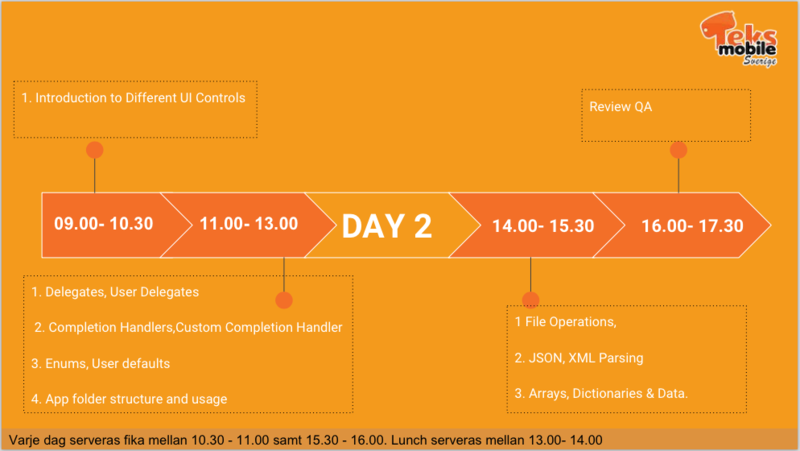 14:00-15:30 – Second Application – Event Driven Programming (button click), Develop an app for demonstration communication between Intents. 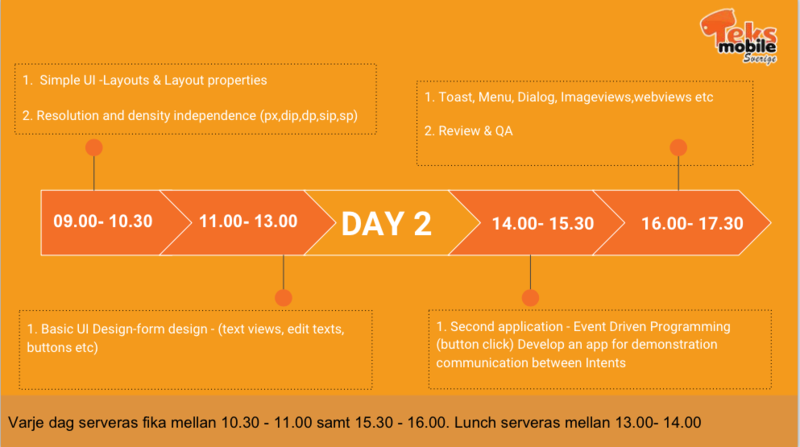 16:00-17:30: Toast, Menu, Dialog, ImageViews, WebViews, and more. Globally renowned mobile app entrepreneurs as guest speakers. Live Demonstrations (at Deal With Droid 2016). 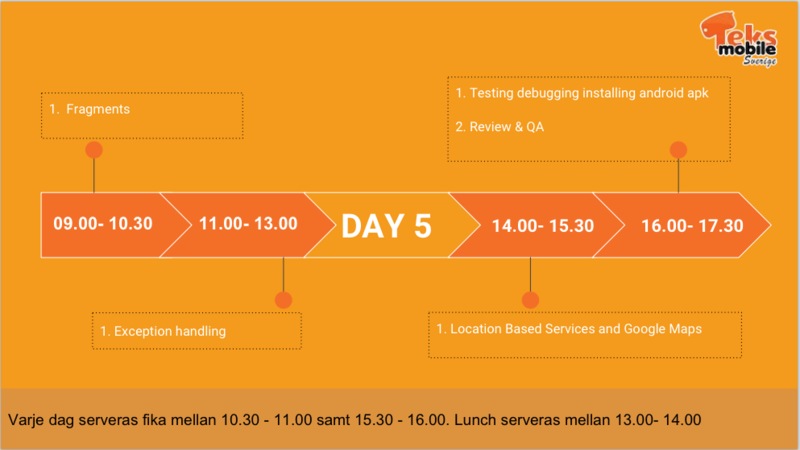 Special sessions on app testing/debugging, agile development. 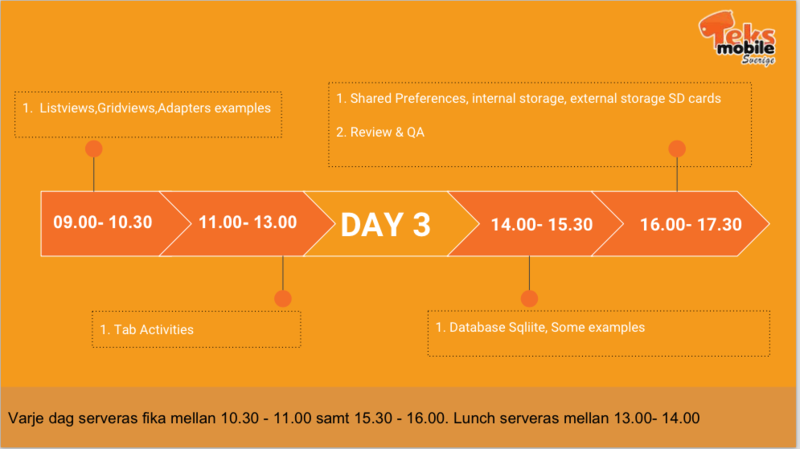 Separate ‘Review & QA sessions’ (on each day, at both the workshops). 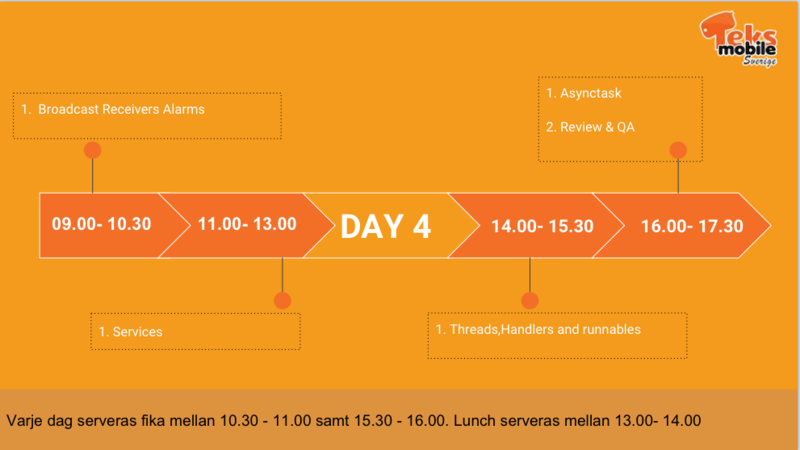 Candidates can also send emails to info@teksmobile.se for tickets. 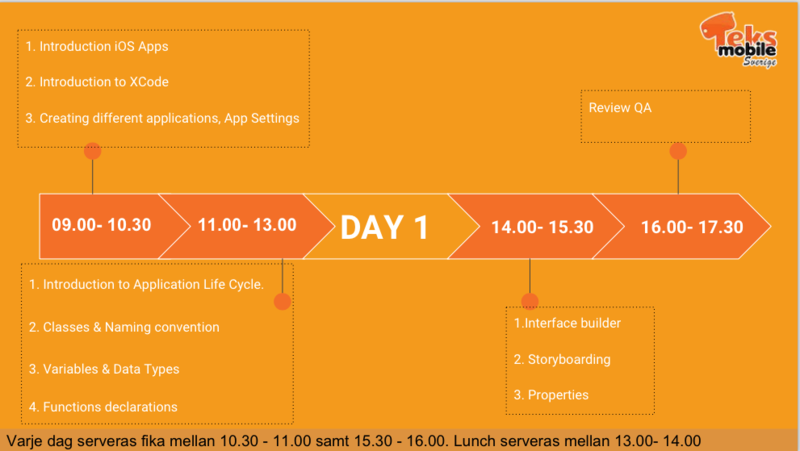 The Registration Fee for the iOS and Android training workshops is SEK 20000/person. For groups of 6 or more people, we have a special discount of 10%. 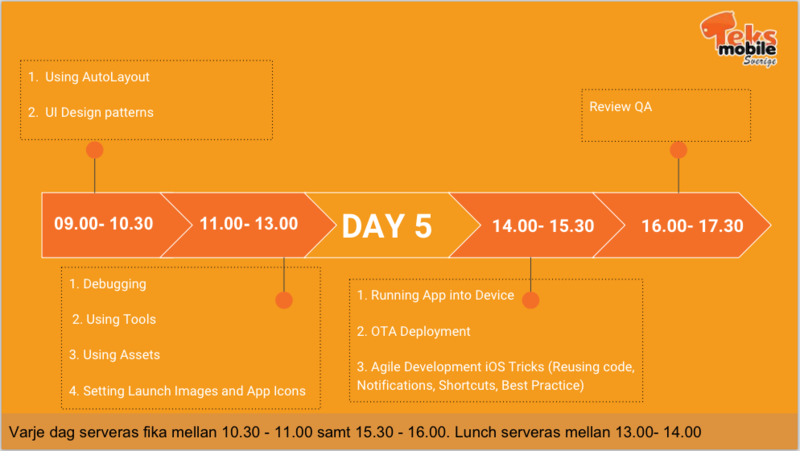 We would love to have lots of learners at the event – and we are confident about being able to help them learn how to make mobile apps…thoroughly. All registered attendees at ‘iOS-Con 2016’ and ‘Deal With Droid 2016’ will also be provided a three-month coding support service (from the Teknowledge Software staff), absolutely free. If and when an attendee gets stuck while programming for an app, all that (s)he will have to do is get in touch with us via phone, email or Skype. We will resolve the issue(s) promptly. Registration for ‘iOS-Con 2016’ and ‘Deal With Droid 2016’ closes on April 25. Book your tickets early…or you might just miss out! 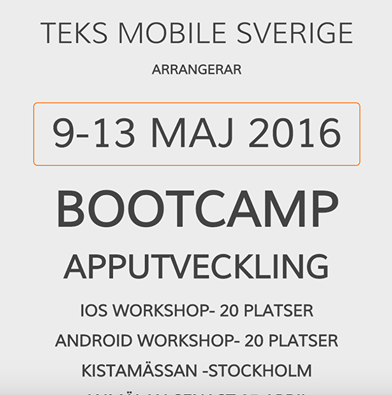 We look forward to seeing all you readers in Kistamassan, at the iOS/Android workshops. Register early…and learn all the nitty-gritties of mobile app development from the top industry leaders. iOS 9.3 stable release – As many as 7 betas of iOS 9.3 have been released by Apple (the first one was back in January), and the final version of the platform should be announced at the event. Arguably, the most interesting new feature of iOS 9.3 is ‘Night Shift’ – which changes the display of iPhones to warmer textures at night, to ease visibility and minimize chances of eye strain. The chance to share single devices (e.g., iPads) is another handy feature of the new platform (particularly for students). The wifi-based calling support for Verizon is worth a mention too. iPhone SE – Apple is all set to announce two different iPhone models for the first time in 2016. The regular September event will witness the arrival of iPhone 7, powered by iOS 10. But that’s for later…on Monday, the company will be releasing the 4” iPhone SE. The ‘smaller’ phone will look a lot like iPhone 5S (there is an outside chance that Apple might pull the plug on the latter model sometime soon), and will come with several high-end features of iPhone 6/6S. Apple Pay will be usable on iPhone SE, and the phone will have a 12 MP camera, with the highly-applauded ‘Live Photos’ option. ‘Hey Siri’ will be bolstered by the A9/M9 processor chips of the new phone. According to experts from the field of mobile and app development, iPhone SE would: a) motivate more people to upgrade their older iPhones, and b) help Apple penetrate newer markets (like India) better. With a price tag of $375-S450, it should be a ‘budget iPhone’ to look forward to. Some update on iPhone data encryption – Apple Inc. is heading for a legal hearing with the federal government on March 22 over the issue of overriding the data encryption of an iPhone – in the backdrop of the San Bernardino shooter. It is extremely likely that Tim Cook would take the opportunity a day earlier to explain why Apple has not given in to the demands of the FBI. The company feels that any tweak with its encryption methods might put all iPhone-users at risk, and this point should be discussed at length during the event. More Apple Watch bands – Apple Watch 2 won’t be making an appearance on March 21, but Apple will keep trying to make its smartwatch even more popular. A smart space black Milanese loop will feature among the new set of Watch bands showcased at the event. The bands would, in all probability, brought to market as standalone accessories. Apple Watch Sport will also get a new line of Spring bands. Those looking for Watch bands with new styles won’t be disappointed either – with the Cupertino company set to release special NATO-style Watch straps. Rumours are also rife that Apple might announce more colour options in its Hermes line of bands. Third-party Watch band designers may be in for some good news too. OS X 10.11.4 – After a fast start, the adoption rate of OS X El Capitan (10.11) has slowed considerably. 4 months after official release, about 44% of all Mac-owners had upgraded to the new operating system – a figure that is nearly 7 percentage points behind OS X Yosemite and is even lower than OS X Mavericks (after the same time following release). Apple will be looking to set this right, with the launch of the OS X 10.11.4 upgrade at the March 21 event. It will support seamless data import and export with Evernote and, more interesting, bring in the Live Photos feature inside the Messages app. The Notes app will also be improved. New, smaller iPad Pro – After a fair bit of speculation, it is pretty much certain now that the new iPad model that Apple will launch at the event will be an iPad Pro (and not an iPad Air). The new iPad Pro will have a 9.7” screen, and will run on the cutting-edge A9X processor. Reports from iPad app development forums online suggest that Apple will be going for a slightly thicker body for the model, to accommodate the quad speakers. The 12 MP camera will be, in fact, an improvement over the 8 MP option available on the 12.9” iPad Pro. The new Apple tablets will support 4K videos as well. Thanks to the Smart Connector, both the Apple Pencil stylus and the Smart Keyboard will be usable with the new iPad. iPad sales have been in freefall for several quarters now (even the launch of iPad Pro could not arrest the slide), and it remains to be seen whether the new form factor manages to revive the flagging interests in Apple tablets. tvOS 9.2 – There is a host of new features bundled in tvOS 9.2, which would also see the light of day on March 21. In order to make the new Apple TV 4 (released in 2015) more user-friendly, tvOS 9.2 will offer complete iCloud Photo Library support, while Siri on Apple TV will also be given a heads up. Mobile app developers have also predicted a comeback of the Conference Mode room. To ensure easier search queries as well as entering usernames and passwords, tvOS 9.2 will also be having a Voice Dictation Input option. Bluetooth keyboards will be supported on the platform too. New Mac systems – Perhaps the least likely of the announcements on this list, but Apple might very well spring a surprise here. Those who make Mac OS apps and iOS apps have been talking about the chances of new upgrades of the 12” MacBook as well as the MacBook Pro systems being displayed at the March 21 event. In the MacBook Air lineup, the company is mulling over the prudence of replacing the 11” model with a new 15” model. If not at this event, the new Mac systems should definitely be announced at the Apple WWDC in June. watchOS 2.2 – Together with iOS 9.3, this is the joint-most important new software announcement that is likely to happen at the upcoming event. Yelp-powered local search options are among the several new enhancements of the platform, which also comes with many new Action screens and a significantly improved Maps app (for easier navigation of users). Those who make apps for Apple Watch have, however, singled out the feature that allows a single iPhone to be paired with several smartwatches as the most impressive in watchOS 2.2. An update for iTunes – Once again, not very likely, but is certainly possible to happen. Apple app developers have been reporting for some time now that an iTunes update is in the works – which focuses on bug fixes and smoother performance (instead of bringing in a lot of new features). With the Mac OS and iOS all getting refreshes, releasing the iTunes update would certainly make sense. You will have to wait till fall for an update to Apple Music, however. There is not likely to be any mention about Apple Car – which won’t to be ready before 2019. Apple March events have made a splash before too – with the launch of iPad 3 (2012) and Apple Watch (2015). This year’s Spring event, however, promises to be the biggest of them all. 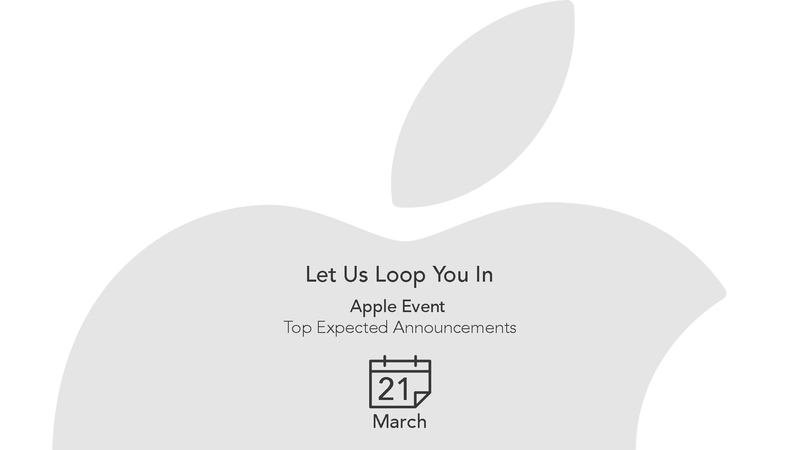 It will be interesting to note how many of the above announcements are actually made on March 21.